Robert Morris is regarded as one of the most influential figures in American postwar and contemporary art. He has been heralded a pioneer of the minimalist and Anti-form movements and is also considered to be one of the most prominent theorists of art and art making of his generation, having written numerous critical essays on the subject throughout his career. His iconoclastic and interdisciplinary oeuvre spans sculpture, installation, drawing, performance, film, and dance. In his new exhibition, Refractions, Morris brings together six works produced at various points during his career – the earliest dating from 1961, and the most recent from 2014. This sequence of works conveys his unconventional handling of sculptural forms to create dynamic and sensory relationships between object, space, and viewer. Morris’ unique approach to the medium of sculpture evolved from the mid-1960s. Proceeding from minimalism, he detached himself from the autonomous aura of the art object to address, above all, the process of artistic production, consistently bringing it to the fore as an essential component of his work. Morris adopted industrial materials such as plywood, fiberglass, aluminum, steel and felt, to produce pared-down geometric forms that were often fabricated by industrial workers under his instruction. 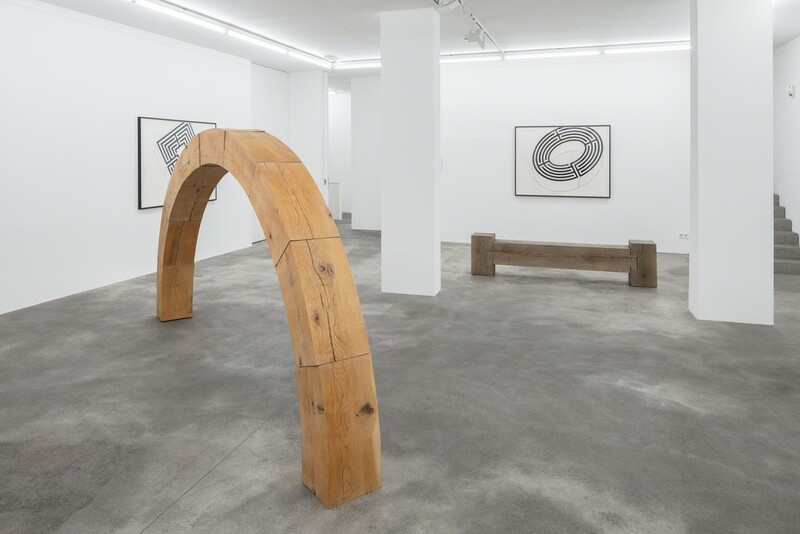 These choices positioned him alongside other American minimalist and post-minimalist artists, as well as their European counterparts from the Arte Povera movement; both were predicated on the liberation of art objects from the restraints of traditional practice and materials. Morris’ early works explored notions of space and movement, often incorporating mirrored surfaces or creating human-scaled passageways or portals that the viewer could traverse. For instance, Untitled (1965), was an asymmetric arrangement of four mirrored cubes measuring exactly three feet square, which reflected both the surrounding exhibition space and the mobile body of the viewer within it. These particular concerns derived, in part, from Morris’ involvement in the 1960s with the Judson Dance Theatre in New York. Alongside artists such as Carolee Schneemann, Lucinda Child and Yvonne Rainer, he had choreographed a number of dance performances that stimulated an interest in movement, and the activity of bodies in space quickly emerged as a fundamental constant in his sculpture. 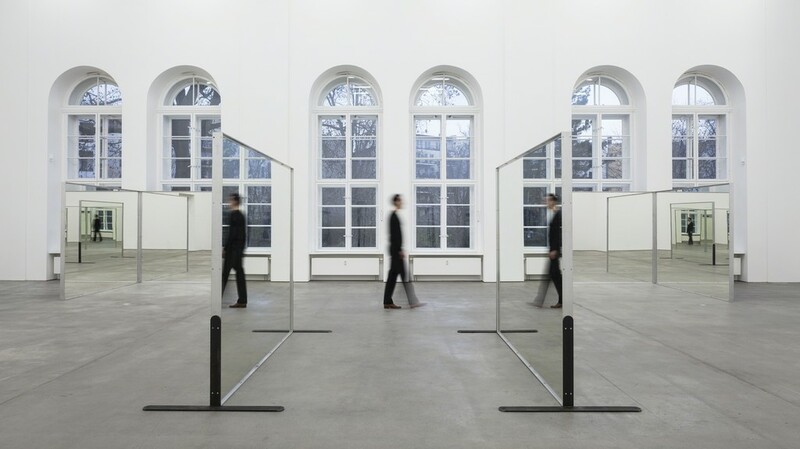 In the main room of Refractions, the viewer is confronted by an installation of twelve rectangular mirrors, each measuring nearly two and a half meters across. 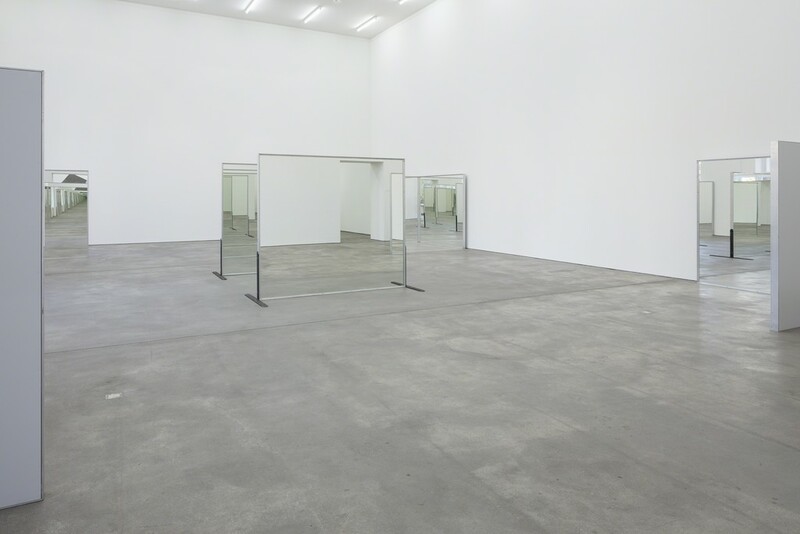 Untitled (Williams Mirrors) (1976-77) positions a double-sided pair of mirrors in the middle of the room and four pairs of one-sided mirrors at the corners – meaning that the reflection in each mirror appears to multiply infinitely. As the viewer moves through the space, weaving in and around the constellation, it becomes almost impossible to distinguish real bodies from their reflections, or to perceive their exact locations within the space, as the duplicated images appear to be dislocated from their surroundings. 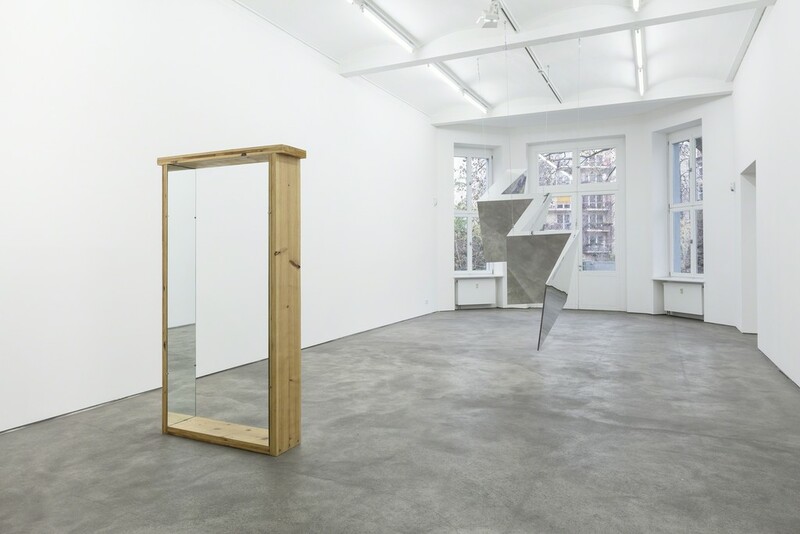 Morris succeeds in animating the entire room, creating a complex and constantly shifting territory of recognition and misrecognition that destabilizes viewers’ assumptions about their immediate physical reality and radically undermines the typically static act of self-observation before a mirror. The work was first shown in 1977 in the courtyard of the Clark Art Institute in Williamstown, Massachusetts, during Morris’s tenure there as Artist-in-Residence. Guided by Morris, a group of ten students from the Institute were involved in the erection of the sculpture. This process was documented in a videotape that became an integral part of the work at the time, with Morris attempting to expand the viewer’s artistic appreciation of the work by presenting the production process alongside the finished object. In contrast to the dizzying flux at work in the main room, the sculptures in the succeeding room engage the viewing body in a series of contemplative transitions as it moves through the space. The first encounter is with Strike (2012), a monumental concertinaed structure of polished aluminum and arctic birch elements that is suspended from the ceiling. Exhibited here for the very first time, the sculpture engages the ongoing concerns within Morris’ practice. For instance, the reflective, modular surfaces negate any promise of a cohesive vision of the space, instead reflecting and refracting it as an assortment of disjointed body parts and architectural details. It is followed by Untitled (Pine portal with Mirrors) (1961), which is an early example of Morris’ use of sculpture to engage the moving body, and was produced in the same year as several other ‘Portal’ works. 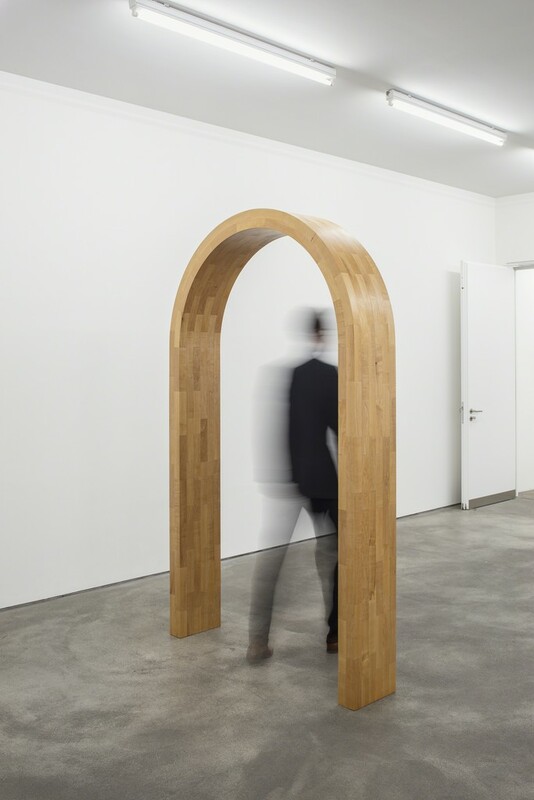 Here, the illusion of a passageway invites the viewer to pass directly through the work, simultaneously appearing like a stage prop for a dance or performance. Meanwhile, the individual reflections in its mirrored surfaces solicit from the viewer a more familiar, static form of self-observation. 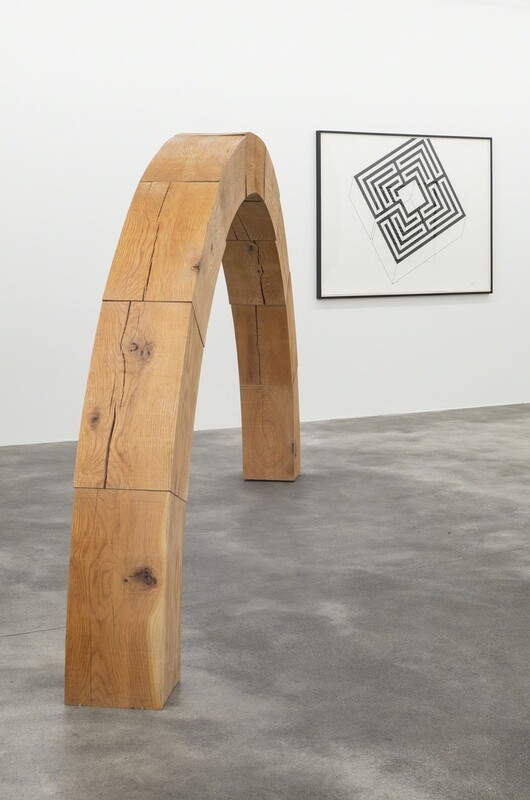 The wooden sculptures, Maple Arch (2012) and Roman Arch (2014) encourage movement in a different but related way, retuning the viewer to a sensory and unmediated experience of their surroundings as they pass through the human-scale channels of negative space created by the sculptures. Finally, the body-in-motion is stilled at the invitation to rest on an oak bench. 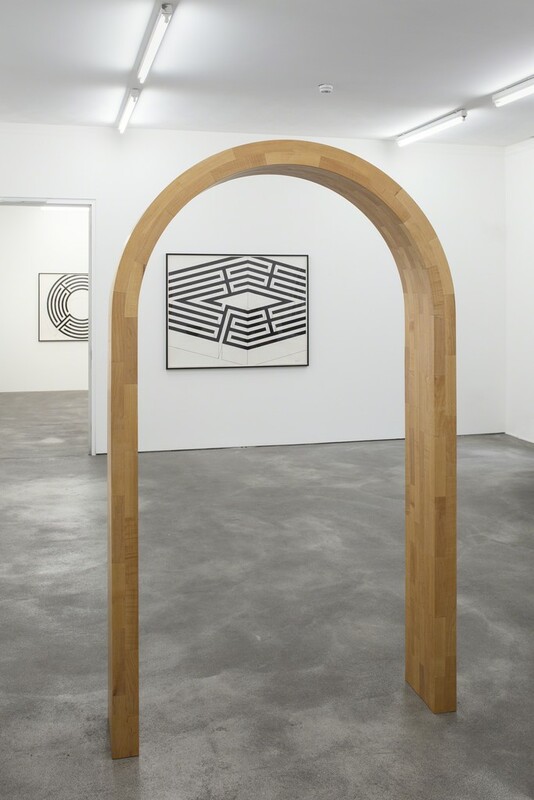 In Bench (2013), Morris reinforces the concerns addressed by the preceding sequence of works in the exhibition and foregrounds the continued legacy of minimalism. Once again, he removes sculpture from its pedestal or plinth so that it can physically intrude on the space of the viewer, involving him or her directly, and actively, in its perception. Robert Morris (born 1931 in Kansas City, USA) lives and works in New York State, where he is a professor at Hunter College. Morris has exhibited at many international institutions. Selected solo exhibitions include the Whitney Museum, New York (1970); the Tate Gallery, London (1971) and the Museum of Contemporary Art Chicago (1986). He was represented at documenta 6 (1977) and documenta 8 (1987), as well as the 38th and 39th Venice Biennials (1978 and 1980 respectively). Extensive retrospectives of his work have been held at the Guggenheim Museum, New York (1994) and the Museum Abteiberg, Mönchengladbach (2010). As of November 2016, his work is permanently on view at the Dia:Beacon, New York.